Besides the free breakfast free Wi-Fi and indoor pool La Quinta Inn & Suites's convenient location and well-appointed rooms are a big hit with our guests whose ratings make this one of Bowling Green's most popular properties. All 66 rooms on three floors are furnished with flat-panel TVs microwaves and mini-fridges. Guests get free Wi-Fi access and local calls at no charge. Start your day with the complimentary breakfast including hot waffles eggs cereal pastries fresh fruit and all the coffee and juice you can drink. The heated indoor pool is a great place to spend some time or you can keep moving in the fitness center. Parking is free and pets are welcome also at no charge. 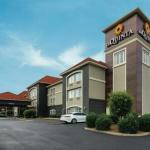 The La Quinta Inn & Suites is convenient to I-65 and 15 minutes south of downtown Bowling Green. Hungry guests will find a variety of restaurants within walking distance. Western Kentucky University is five miles from the hotel. Bowling Green Convention Center is just a mile away and shopping at Greenwood Mall is two miles from the hotel. Guests can explore the awe-inspiring Mammoth Cave and National Park just 30 minutes away. Bowling Green-Warren County Airport is less than two miles from the hotel. Dogs of all sizes are allowed for no additional fee; there is a pet policy to sign at check in. Dogs may only be left alone in the room if they will be quiet and well mannered.